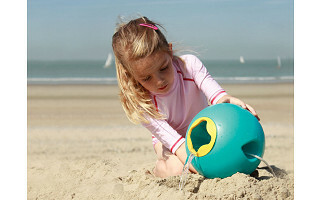 Quut is pronounced as cute, and there’s much more to these European designed pails, shovels, and rakes than meets the eye. 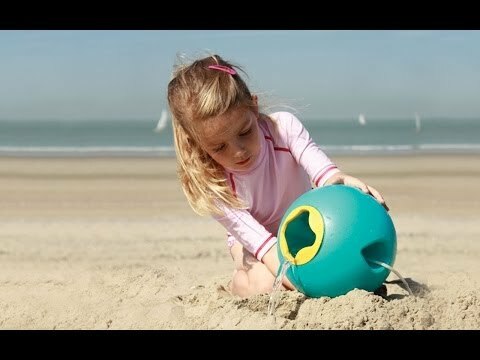 Created by a group of industrial designers in Belgium who, with 24 children among them, have gone through their fair share of beach toys over the years, Quut products are built for building and made to last. The Scoppi is a combo shovel/sifter uniquely shaped to not only scoop, but filter out rocks as well. It’s even strong enough to dig through snow. The whimsical looking Ballo bucket isn’t just for show. Its spherical shape and ergonomically designed handle make transporting water from ocean to castle easier than ever with minimal spillage. Then, there’s the Tripleti, a multi-functional tool engineered for digging holes, building foundations, leveling sand, and carving out moats. 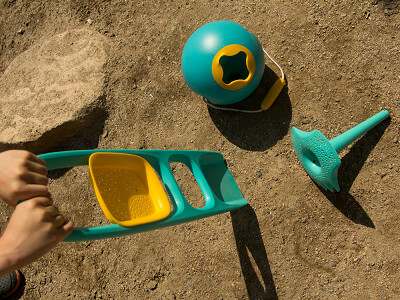 There’s no telling what you and your kids can build with sand tools as functional as they are aesthetically pleasing. Sand castle contest, anyone? Quut is pronounced as cute, and there’s much more to these European designed pails, shovels, and rakes than meets the eye. 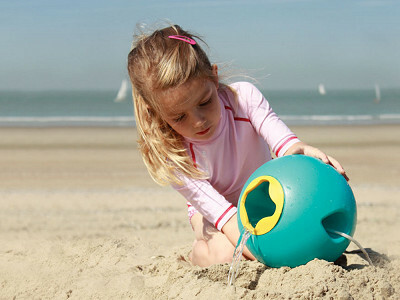 Created by a group of industrial designers in Belgium who, with 24 children among them, have gone through their fair share of beach toys over the years, Quut products are built for building and made to last. The Scoppi is a combo shovel/sifter uniquely shaped to not only scoop, but filter out rocks as well. It’s even strong enough to dig through snow. The whimsical looking Ballo bucket isn’t just for show. Its spherical shape and ergonomically designed handle make transporting water from ocean to castle easier than ever with minimal spillage. Then, there’s the Tripleti, a multi-functional tool engineered for digging holes, building foundations, leveling sand, and carving out moats.